Are you a big fan of sour cream? Do you like topping your baked potatoes, perogies, and beef stew with this rich, savoury goodness? I know I do, and that makes today a very important one for me – a day very close to my heart. You see (and I say this with the utmost sadness), today my beautiful and delicious container of heaven reaches its best-by date; today my sour cream expires. Let’s have a moment of silence and remember. Coincidentally, that’s not the only thing that happens today. Today is actually a very important day, and I’m proud to say that it’s my dad’s birthday! Because of this, I decided to dedicate this article to him, and brag to all of you guys about just how awesome my daddy is. So here is my list of the top ten reasons (I could’ve easily gone to 50) why I have the best dad in the entire world! 1. He is absolutely the smartest person I know. He graduated high school at the top of his class, graduated college at the top of his class, and knows every single fact about everything, I swear. His intelligence has always been very inspiring to me, and caused me to reach my full potential when I was in school. 2. He is the funniest person I know. My dad is constantly making jokes about everything, and he can always make me laugh. We have so many inside jokes, and he knows how to crack me up with only a couple words – Hat das Kalb keine Mutti? 3. He always has time for me. Growing up, I was very lucky to have my dad around – all the time. And now that I’m older, nothing has changed. If I want him to play with my hamster with me, if I want to go for a drive with him, if I want to watch tv with him, he always has time for me. 4. He speaks German with me. I’ve always had an interest in this language, and my dad has done so much to help me learn it. From making jokes to reading stories (hey dad, remember Bobo Siebenschläfer?) to just making general conversation, my German is where it is because of my dad. 5. He boosts my self-confidence. Let’s face it, I have never been a “skinny, beautiful” person. But for some reason, my dad thinks I am. 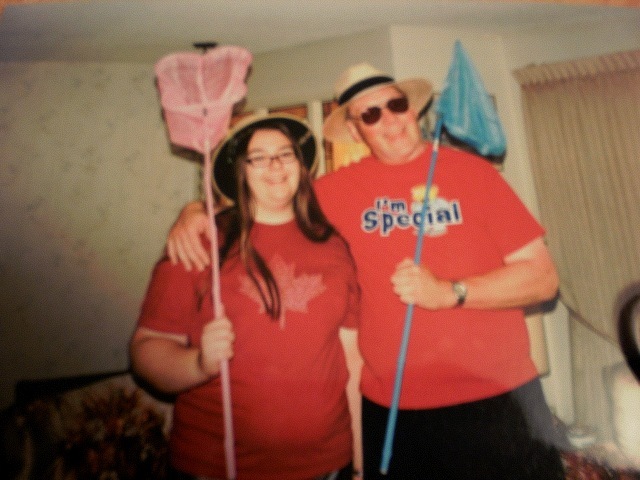 Even back when I was 270lbs, my dad never once told me I was fat (and he’s probably the only person too). He said, “You’re smaller than me, you’re skinny.” And even though that made me chuckle and obviously wasn’t completely true, it made me feel better about myself. 6. He supports me. Whatever I decide to do in life, I always know that my dad is behind me 100%. When I decided to play the clarinet he supported me, and complimented me through all the squeaks and wrong notes. He tells me I am an awesome writer, and reads every single one of my blog posts. When I decided to take some time off of school, he backed me up. My dad is always there for me, and it means a lot. 7. He gives really good hugs. Whether I’m feeling happy or sad, or whether I need one or not, my dad’s hugs always make me feel better. Always. 8. He has excellent tastes in music. My dad listens to tunes from all the greatest artists – Petula Clark, The Seekers, Dana Winner, Nena, The Turtles, Herman’s Hermits – and the list goes on. Our identical music preference is just one of the many things that my dad and I have in common. 9. He is an awesome cook. My dad makes me breakfast every morning, and can also cook the most delicious Kliesel, scrambled eggs, breakfast sandwiches, and fried rice. Is there any wonder why I'm not skinny? 10. He makes me feel loved. This goes back to when I was little, and my younger sister was born. She was getting a lot of attention, especially from my mom, and I was feeling a little left out. But my dad told me, “Brianna is mommy’s baby, and you are my baby,” and that made everything better. Every single day of my life, there has never been a question in my mind whether or not my dad loves me. The list goes on and on, and like I said before, I could easily go past 10. My dad is the most awesome person I know, and he’s more than just my dad – he’s one of my best friends. I know there will be parts of this article that you won’t understand (I incorporated a lot of inside jokes), but I think I got my point across: I have the coolest, best dad in the entire world. That being said, I will close in the classiest way I can think of – Der Wind bläst von hinten!